It is difficult to imagine that something as simple as food would not be accessible by the poor. But the fact is that there are no grocery stores in many low-income neighborhoods across America, which means low-income families are not eating healthy. So one non-profit organization in St. Louis packed a bus full of fresh food and took it to people who live in poor areas. Who came up with this idea? The St. Louis MetroMarket, known locally as "Turnip 1", is the brain child of Jeremy Goss, a St. Louis University medical student and one of the founders of MetroMarket, and co-founders Colin Dowling and Tej Azad who are both Washington University graduates. It's a grocery store on wheels. It sells food from local farmers and community gardens, including fresh fruit, vegetables, meat, dairy and breads. The walls inside the bus identifies where the food came from, and food preparation demos are held outside the bus by volunteers as well as workers. How is it being funded? 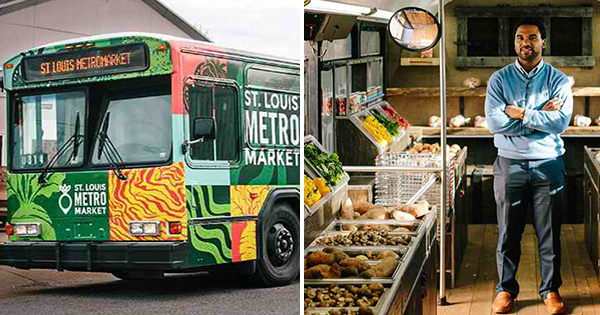 The grocery store on wheels idea would probably not have gotten off the ground if it had not been for donations and grants, as well as the bus itself, which was donated for free by the St. Louis’ metro transit department. Food is sold on a sliding scale. The program is especially well supported by corporations who often subsidize the memberships for their employees so they can benefit from fresh, wholesome food. The corporate support also enables the bus to waive the membership for low-income people living below poverty in areas where there is no grocery store. If you live in the St. Louis area, you will probably catch sight of the big green grocery store bus as it makes it's rounds in corporate parking lots and low-income neighborhoods. It's like bringing a farmers market right to your front door.